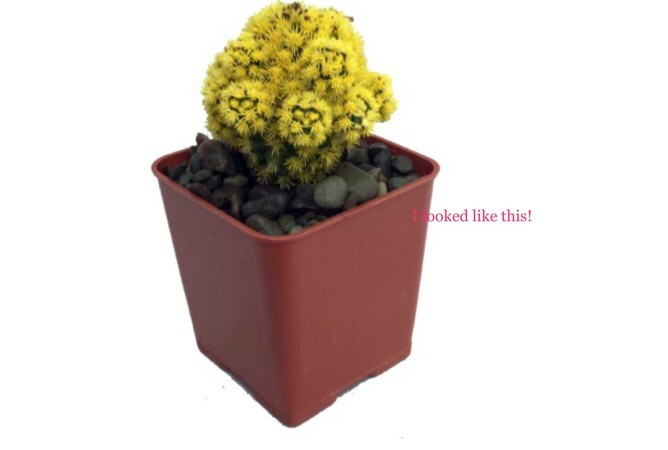 Write About - Tiny the Cactus. “Ha ha look at how small he is!” Snickered one flower. “look at his color is he part dandelion!” Remarked another. “No way is he a lion he’s to shy!” They all laughed in unison. The small yellow cactus sighed and just ignored them. “No wait, look at how cheep he is! Only one dollar!” The laughs from the four purple petunias shook the walls of the Kroger, making them feel like small knock of brand cookies. “only one dollar, imagin how fast it will die!” Then puts him down, his smile went from ear to ear went to to chin to chin. He sighed to him self as the speakers from above him boomed about how it’s was time for the store to close. The tiny cactus just sighed and whispered to himself Maybe tomarow. “I LOVE it!” Tiny said. With his new name he felt stronger than ever, so strong he felt powerful for once! “one dollar! What a steal!” Tiny felt happier than ever he knew that he had someone to love him. Disclaimer: this story was about my yellow cactus from Kroger. disclamer two: I whould have a picture of him but he died here recently, very sorry.